My research focuses on the design career of Natacha Rambova (active 1916-1933). Though she is mostly remembered for her marriage to actor Rudolph Valentino, my work studies Rambova’s design contributions to ballet, Broadway, film and fashion between 1916 and 1933. 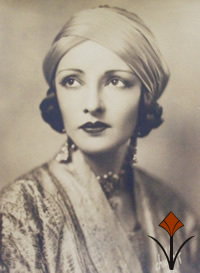 Based on her personal sense of style, she designed exotic clothing based on a wide variety of historical and cultural interests. Born in Utah in 1897 as Winifred Shaugnessy, she was raised in San Francisco and educated in Europe. She adopted the name “Natacha Rambova” while a dancer for Theodore Kosloff’s Russian Ballet and shortly before her 1917 arrival in Hollywood. After meeting the Russian actress Alla Nazimova, Rambova began her film career, acting as art director for such films as Camille (1921), Salome (1923) and Monsieur Beaucaire (1924), among others. She created stylized and often fantastical costumes and sets in Hollywood, before moving on to New York, where she designed for the theater, appeared on the stage and opened a fashion studio. Her interest in international styles, mythology and mysticism as well as her European sensibilities and education were reflected in her design aesthetic. My work on Natacha Rambova thus far has included an exhibition at the Phoenix Art Museum, several articles in scholarly publications, and a number of lectures around the country. It was also the subject of my Masters Thesis at New York University. A book is currently in progress. “Natacha Rambova, Fashion Designer (1928 – 1931).” Dress: Annual Journal of The Costume Society of America, Vol. 33: 2006 (released in May 2008). “Natacha Rambova Fashion Designs.” Costume Australia. 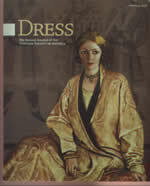 A publication of the Museums Australia Costume Special Interest Group. Fall 2008. “In Search of Content” Lecture Series of the Costume Council for the Los Angeles County Museum of Art, Los Angeles, CA, Personality & Style: The Fashion Career of Natacha Rambova. October 2005. Armchair Tour of Personality & Style: The Fashion Career of Natacha Rambova at the 31st Annual National Symposium of the Costume Society of America, in Philadelphia, PA, May 2005. Personality & Style: The Fashion Career of Natacha Rambova Lecture. Presented in tandem with the exhibit at the Phoenix Art Museum, Fashion Gallery (two lectures), September 2004. Annual Richard Martin Costume Symposium at New York University, NY, April 2004. 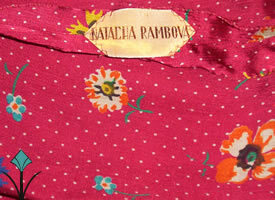 Thesis Presentation of Personality Goes a Long Way: The Fashion Design Career of Natacha Rambova 1928-1931.